Sgraffito is an old technique used by many artists throughout the ages to create fine details. By putting one color under another one and scraping through the upper layers, you can show just a speck of contrasting color. In oil painting, watercolor or acrylics the upper layer should be wet before it's scraped away as the paint film dries thick and solid. For colored pencils, crayon work or oil pastels, you can do it anytime, even if your oil pastel brand "sets up" to become firmer after it's been left overnight. Above is a sample page I did showing how sgraffito looks with many different bottom and top combinations, using Caran d'Ache Neopastel oil pastels in complementary colors and black and white. Notice that sometimes the light colors going over dark are not completely opaque. I went over the white twice, letting it set up overnight and adding more to get a lighter hue, but it still looks gray compared to white over white paper. The lesson is: test your combinations on scrap paper or in studies before doing a large serious painting. If I am going to use sgraffito for a fine detail such as the "eyeshine" white speck in the dark pupil of an eye, I'll be sure to place white oil pastel in the spot for the eyeshine first and then go around and over it with the black pupil and color of the iris. Then at the end I'll carefully lift out just the speck itself and edge up close to that with a Colour Shaper so that I have relatively little of the color around it lightened by the white I scraped back to. It is important to apply the white to anything where you want scraped details. Scraping will not restore the white of the paper but only give a lighter stained version of the color scraped through unless you put a white layer or a light color under it. You can get yellow, light pink or other light hue details easily just by planning your sgraffito effects in advance. I demonstrated how this technique looks in practice at the bottom of the page with some leaf ribs just scraping back to a lighter color. All the leaves were drawn with flat light color under the shading so that you can see how a contrasting sgraffito line looks in use. 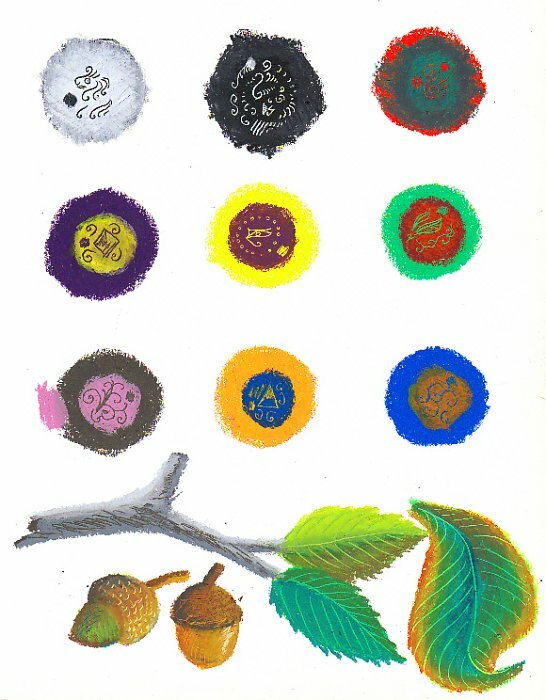 The left acorn had a light underpainting for the cap, the right acorn had a darker underpainting on the cap to create dark details by scraping. The twig for the leaves had an underpainting in dark brown with gray and white over it, scraped back to create a bark texture in the shadows. You can use any pointed stiff object to scrape away lines in oil pastel for a sgraffito effect. Toothpicks, either wood or plastic, are good scrapers. 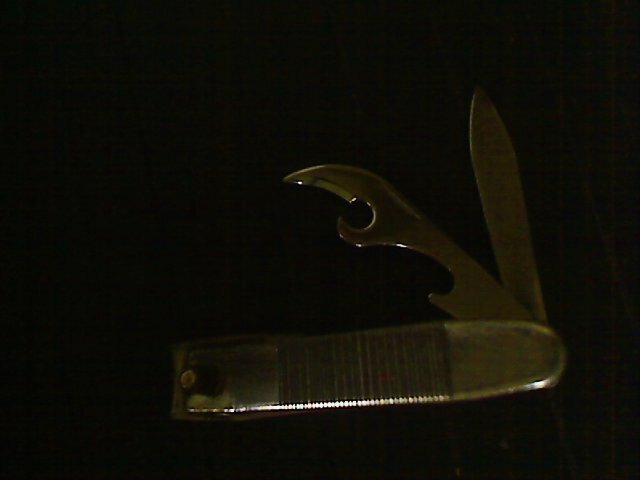 My personal favorite is the nail cleaning knife or the pointed can opener on my nail clippers. The scraper end of a watercolor brush can work if you want a chisel-type line, it usually isn't pointed but held on edge it will give a fine straight line or slightly curved line. Using an empty ball point pen can work to give a line exactly the width the pen line had when it was fresh and had ink. Be sure the ink is entirely used up though. Test it scribbling repeatedly on scratch paper, since you don't want black or blue lines coming in where you want a light colored mark scraped. Sgraffito is a technique that gives the same dramatic results as scratchboard drawing. One of the most beautiful ways you can use it is to build a brightly colored underpainting with white elements and then cover the whole thing with thick black or dark color, then scratch back your design in careful lines. This gives a light on black fine-line delicacy to the finished art that can be superb in night scenes or create a gorgeous illustrative quality. Scratchboard tools come in wide variety including wire brushes for texturing, parallel line tools with three or four needles mounted to a handle, and various widths and shapes of scrapers. It's useful to know this if you want to use any of these special textures doing sgraffito in oil pastels. Yarn needles tend to have just the right point for lines that don't tear the surface of the paper. Sewing needles may be too sharp and rip the paper instead of just revealing the underlayer. For bold scraped lines, using the bowl end of a metal spoon can give grand huge calligraphic effects. So can a fork with all but one of its tines bent back, or use all the tines for a parallel lines scraper on a large scale. Your choice of scraping tools is limited only by your imagination and creativity. Try anything with a point on test strips and work out the best color and texture combinations for the effect you'll use in a serious painting later. Scraping can also allow a save on a part of a painting that got ruined or muddied. If I want to add a white highlight using Walnut Hollow oil pencils then I'll use my nail clipper to scrape back the highlight area before using the white pencil. This can really help if you forgot to put one in when doing the first layers of oil pastels. If the error is a big one, use something like a spoon or non serrated butter knife to scrape off large swaths of color all at once. Clear off as much as you can to get back to the paper surface, then apply your chosen new colors and carefully blend at the edges so the patch isn't visible. Some sgraffito effects are so careful and precise that you can't see them as such. You know they're there because you remember doing them but the results are striking precisely because they aren't visible as a texture difference. Eye highlights often fall in that category for me. Sometimes the white highlights on fruit are too muted if I didn't put one underneath to scrape back to it, so I'll use the sgraffito fix by scraping as far as I can and then using Sennelier or Holbein white to go over the scraped area. This can often get almost all the way to white. Other times I do remember to sketch in white reflection highlights before adding color. 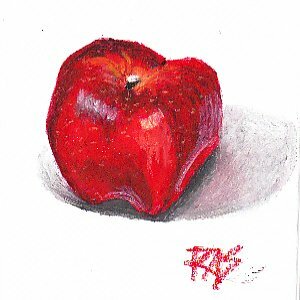 I honestly can't remember which I did when I created this Red Delicious Apple, but know I've done both at different times with different fruit paintings. If the area scraped is large, it's easy to go back over it with light colors or white and leave no texture difference. I muted the highlight to the left and blued it slightly because it wasn't pure white, while I kept the right side highlight brighter and touched into it with yellow since its light source was more golden. Both of these came out as prominent as I could ask for when I scraped and added color over the sgraffito. The yellow specks on the apple were scraped in through the red to a golden yellow layer under it.